A versatile back-row with a tremendous pedigree in Sevens rugby, Liam Messam has established himself as a valuable member of the All Blacks squad. Messam broke into the Chiefs side in 2006 and, after proving himself in Super Rugby over the course of the next couple of seasons, he was handed his All Blacks debut at the tail end of 2008, in the November international against Scotland at Murrayfield. 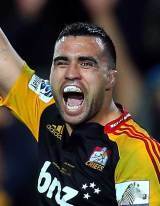 His second cap came against France in Dunedin the following year and Messam marked the occasion with a try. However, New Zealand slumped to a shock defeat on a day on which their forwards struggled and Messam did not return until the clash with Italy in Milan later in the year. The game against the Azzurri was noteworthy for Messam because in his two previous outings for the Kiwis he had been deployed as a No.8; against Italy he was used as a flanker. His versatility was being viewed as a hindrance in his attempts to nail down a regular berth in the All Blacks back-row. He made two appearances against the Springboks during the 2010 Tri-Nations, both as a replacement flanker, before playing his part in New Zealand's Sevens triumph at the Commonwealth Games. But while his international aspirations stalled when he missed out on a spot in the All Blacks' squad for the 2011 World Cup, he was shining on the Super Rugby stage. His impressive form for the Chiefs during the 2012 season saw him help propel them to their maiden title with him scooping the man-of-the-match gong in the final. He was simply too good to be left out of the All Blacks' set-up. He established himself as their first-choice blindside during the 2012 Rugby Championship and the 2013 Super Rugby season saw Messam continue his impressive form. Similar to 2012, he inspired the Chiefs to the Super Rugby title and in a direct copy of the previous year, he won the Man of the Match award.